North Camden, the first neighborhood settled in what was to become South Jersey’s largest city, is located north of the Ben Franklin Bridge, just north of downtown Camden and across the Delaware River from Center City Philadelphia. It commands beautiful and contrasting views of Philadelphia’s skyline and a natural water edge — but decades of decline, along with the related issues of poverty, crime and abandonment, have negatively affected the public perception of the neighborhood, overshadowing its efforts to rebuild and threatening the community’s sense of hope for the future. Today, however, the community is poised for change. More than $600 million in private investment is proposed for downtown Camden over the next eight years, and the single greatest obstacle to redeveloping the city’s waterfront will soon be removed. Gov. 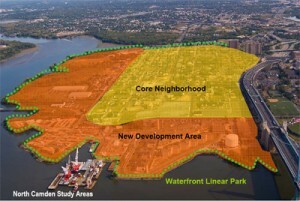 Corzine’s announcement in June 2007 that Riverfront State Prison would close within five years invited a new way of thinking about not only the waterfront’s potential, but also forging connections with the surrounding neighborhood. The Riverfront State Prison Site Reuse Study, completed in March 2006, looked for the first time at the reuse potential of North Camden’s waterfront based on the premise that the prison would be closing. The study served as an important, influential and visionary document. Among other things, it spurred Save Our Waterfront, a grassroots neighborhood group, and other North Camden community stakeholders to update the 1993 North Camden Neighborhood Plan that sought to revitalize North Camden. The comprehensive update of the plan outlines the direction for the North Camden community over the next decade, addressing housing, economic development, human capital development, public safety, circulation and infrastructure, and parks and open space. Many of the recommendations are tailored to low-cost solutions that can be implemented by volunteer efforts and through the capacity of local organizations. Just as important as the plan itself, the planning process served as a mechanism for transforming concerned citizens into an organized community that is energized and focused on implementing a revitalization strategy. More than 255 community members participated in the planning process, attending public meetings, small focus groups and steering committee meetings; filling out surveys; and offering comments during confidential one-on-one interviews. This plan truly belongs to the neighborhood. In conjunction with the planning process for the core neighborhood and vacant waterfront land known as the “opportunity area,” a plan for a linear waterfront park in North Camden was also created. 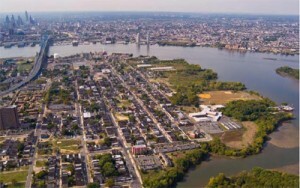 Cooper’s Ferry Development Association, the private nonprofit corporation charged with creating and implementing a comprehensive revitalization plan for the central waterfront, worked on a planning process for the future waterfront park with Save Our Waterfront, Camden Greenways, Camden County Parks, the City of Camden and neighborhood stakeholders. The two plan components fit together seamlessly into one unified document illustrating how public investment in waterfront park development can leverage private reinvestment in North Camden. Just as the waterfront was core to the city’s settlement during Colonial times and its commercial and industrial development thereafter, so does it now hold enormous potential to be a catalyst for Camden’s redevelopment efforts in the 21st Century. Supporting partners in the project are: Interface Studio, LLC; Wallace Roberts & Todd, LLC; City of Camden; Camden County Parks Department; Rutgers University, Camden Campus; and the SOW Steering Committee including Respond, Inc., Grace Lutheran Church, Holy Name Parish, Camden Bible Tabernacle, Hopeworks’N Camden, North Camden Schools, Camden Greenways Inc., CHPlanning, Ltd., NJ Conservation Foundation, and many additional organizations and numerous neighborhood residents.